There is evidence that soldering was employed as early as 5000 years ago in Mesopotamia. Soldering and brazing are thought to have originated very early in the history of metal-working, probably before 4000 BC. Sumerian swords from ~3000 BC were assembled using hard soldering. 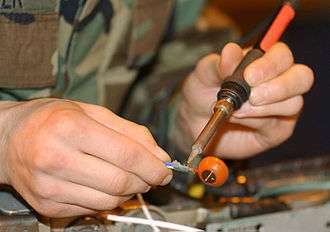 Electronic soldering connects electrical wiring and electronic components to printed circuit boards (PCBs). Other common solders include low-temperature formulations (often containing bismuth), which are often used to join previously-soldered assemblies without un-soldering earlier connections, and high-temperature formulations (usually containing silver) which are used for high-temperature operation or for first assembly of items which must not become unsoldered during subsequent operations. Alloying silver with other metals changes the melting point, adhesion and wetting characteristics, and tensile strength. Of all the brazing alloys, silver solders have the greatest strength and the broadest applications. Specialty alloys are available with properties such as higher strength, the ability to solder aluminum, better electrical conductivity, and higher corrosion resistance. The purpose of flux is to facilitate the soldering process. One of the obstacles to a successful solder joint is an impurity at the site of the joint, for example, dirt, oil or oxidation. The impurities can be removed by mechanical cleaning or by chemical means, but the elevated temperatures required to melt the filler metal (the solder) encourages the work piece (and the solder) to re-oxidize. This effect is accelerated as the soldering temperatures increase and can completely prevent the solder from joining to the workpiece. One of the earliest forms of flux was charcoal, which acts as a reducing agent and helps prevent oxidation during the soldering process. Some fluxes go beyond the simple prevention of oxidation and also provide some form of chemical cleaning (corrosion). For many years, the most common type of flux used in electronics (soft soldering) was rosin-based, using the rosin from selected pine trees. It was ideal in that it was non-corrosive and non-conductive at normal temperatures but became mildly reactive (corrosive) at the elevated soldering temperatures. Plumbing and automotive applications, among others, typically use an acid-based (hydrochloric acid) flux which provides cleaning of the joint. These fluxes cannot be used in electronics because they are conductive and because they will eventually dissolve the small diameter wires. Many fluxes also act as a wetting agent in the soldering process, reducing the surface tension of the molten solder and causing it to flow and wet the workpieces more easily. Water-soluble fluxes - higher activity fluxes designed to be removed with water after soldering (no VOCs required for removal). Flux performance needs to be carefully evaluated; a very mild 'no-clean' flux might be perfectly acceptable for production equipment, but not give adequate performance for a poorly controlled hand-soldering operation. The alloy of the filler metal for each type of soldering can be adjusted to modify the melting temperature of the filler. Soldering differs from gluing significantly in that the filler metals alloy with the workpiece at the junction to form a gas- and liquid-tight bond. Soft soldering is characterized by having a melting point of the filler metal below approximately 400 °C (752 °F), whereas silver soldering and brazing use higher temperatures, typically requiring a flame or carbon arc torch to achieve the melting of the filler. Soft solder filler metals are typically alloys (often containing lead) that have liquidus temperatures below 350 °C. In this soldering process, heat is applied to the parts to be joined, causing the solder to melt and to bond to the workpieces in an alloying process called wetting. In stranded wire, the solder is drawn up into the wire by capillary action in a process called 'wicking'. Capillary action also takes place when the workpieces are very close together or touching. The joint's tensile strength is dependent on the filler metal used. Soldering produces electrically-conductive, water- and gas-tight joints. Each type of solder offers advantages and disadvantages. Soft solder is so called because of the soft lead that is its primary ingredient. Soft soldering uses the lowest temperatures but does not make a strong joint and is unsuitable for mechanical load-bearing applications. It is also unsuitable for high-temperature applications as it softens and melts. Silver soldering, as used by jewelers, machinists and in some plumbing applications, requires the use of a torch or other high-temperature source, and is much stronger than soft soldering. Brazing provides the strongest joint but also requires the hottest temperatures to melt the filler metal, requiring a torch or other high temperature source and darkened goggles to protect the eyes from the bright light produced by the white-hot work. It is often used to repair cast-iron objects, wrought-iron furniture, etc. Soldering operations can be performed with hand tools, one joint at a time, or en masse on a production line. Hand soldering is typically performed with a soldering iron, soldering gun, or a torch, or occasionally a hot-air pencil. Sheetmetal work was traditionally done with "soldering coppers" directly heated by a flame, with sufficient stored heat in the mass of the soldering copper to complete a joint; torches or electrically-heated soldering irons are more convenient. All soldered joints require the same elements of cleaning of the metal parts to be joined, fitting up the joint, heating the parts, applying flux, applying the filler, removing heat and holding the assembly still until the filler metal has completely solidified. Depending on the nature of flux material used, cleaning of the joints may be required after they have cooled. Each alloy has characteristics that work best for certain applications, notably strength and conductivity, and each type of solder and alloy has different melting temperatures. The term silver solder likewise denotes the type of solder that is used. Some soft solders are "silver-bearing" alloys used to solder silver-plated items. 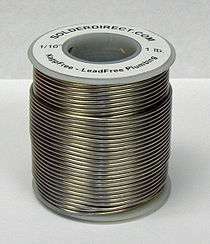 Lead-based solders should not be used on precious metals because the lead dissolves the metal and disfigures it. The distinction between soldering and brazing is based on the melting temperature of the filler alloy. A temperature of 450 °C is usually used as a practical delineating point between soldering and brazing . Soft soldering can be done with a heated iron whereas the other methods require a higher temperature torch or furnace to melt the filler metal. "Hard soldering" or "silver soldering" is used to join precious and semi-precious metals such as gold, silver, brass, and copper. The solder is usually referred to as easy, medium, or hard. This refers to its melting temperature, not the strength of the joint. Extra-easy solder contains 56% silver and has a melting point of 1,145 °F (618 °C). Extra-hard solder has 80% silver and melts at 1,370 °F (740 °C). If multiple joints are needed, then the jeweler will start with hard or extra-hard solder and switch to lower-temperature solders for later joints. Silver solder is absorbed by the surrounding metal, resulting in a joint that is actually stronger than the metal being joined. The metal being joined must be perfectly flush, as silver solder cannot normally be used as a filler and any gaps will remain. When silver solder melts, it tends to flow towards the area of greatest heat. Jewelers can somewhat control the direction the solder moves by leading it with a torch; it will even run straight up along a seam. Induction soldering uses induction heating by high-frequency AC current in a surrounding copper coil. This induces currents in the part being soldered, which generates heat because of the higher resistance of a joint versus its surrounding metal (resistive heating). These copper coils can be shaped to fit the joint more precisely. A filler metal (solder) is placed between the facing surfaces, and this solder melts at a fairly low temperature. Fluxes are commonly used in induction soldering. 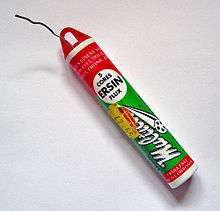 This technique is particularly suited to continuously soldering, in which case these coils wrap around a cylinder or a pipe that needs to be soldered. Some metals are easier to solder than others. Copper, silver, and gold are easy. Iron, mild steel and nickel are next in difficulty. Because of their thin, strong oxide films, stainless steel and aluminium are even more difficult to solder. Titanium, magnesium, cast irons, some high-carbon steels, ceramics, and graphite can be soldered but it involves a process similar to joining carbides: they are first plated with a suitable metallic element that induces interfacial bonding. Currently, mass-production printed circuit boards (PCBs) are mostly wave soldered or reflow soldered, though hand soldering of production electronics is also still standard practice. In wave soldering, parts are temporarily kept in place with small dabs of adhesive, then the assembly is passed over flowing solder in a bulk container. This solder is shaken into waves so the whole PCB is not submerged in solder, but rather touched by these waves. 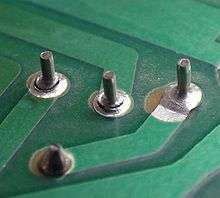 The end result is that solder stays on pins and pads, but not on the PCB itself. For hand soldering, the heat source tool should be selected to provide adequate heat for the size of joint to be completed. A 100 watt soldering iron may provide too much heat for printed circuit boards, while a 25 watt iron will not provide enough heat for large electrical connectors, joining copper roof flashing, or large stained-glass lead came. Using a tool with too high a temperature can damage sensitive components, but protracted heating by a tool that is too cool or under powered can also cause extensive heat damage. Hand-soldering techniques require a great deal of skill to use on what is known as fine-pitch soldering of chip packages. In particular ball grid array (BGA) devices are notoriously difficult, if not impossible, to rework by hand. A heat sink may be used on the leads of heat sensitive components to reduce heat transfer to the component. This is especially applicable to germanium parts. (Note the heat sink will mean the use of more heat to complete the joint.) If all metal surfaces are not properly fluxed and brought above the melting temperature of the solder in use, the result will be an unreliable "cold solder joint". To simplify soldering, beginners are usually advised to apply the soldering iron and the solder separately to the joint, rather than the solder being applied direct to the iron. When sufficient solder is applied, the solder wire is removed. When the surfaces are adequately heated, the solder will flow around the joint. The iron is then removed from the joint. Since non-eutectic solder alloys have a small plastic range, the joint must not be moved until the solder has cooled down through both the liquidus and solidus temperatures. 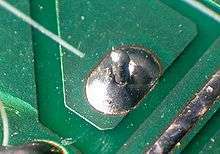 When visually inspected, a good solder joint will appear smooth and shiny, with the outline of the soldered wire clearly visible. A matte gray surface is a good indicator of a joint that was moved during soldering. Other solder defects can be detected visually as well. Too little solder will result in a dry and unreliable joint; too much solder (the familiar 'solder blob' to beginners) is not necessarily unsound, but tends to mean poor wetting. With some fluxes, flux residue remaining on the joint may need to be removed, using water, alcohol or other solvents compatible with the parts in question. Excess solder and unconsumed flux and residue is sometimes wiped from the soldering iron tip between joints. The tip of the iron is kept wetted with solder ("tinned") when hot to assist soldering, and when hot and cold to minimize oxidation and corrosion of the tip itself. Environmental legislation in many countries, and the whole of the European Community area (see RoHS), has led to a change in formulation of both solders and fluxes. Water-soluble non-rosin-based fluxes have been increasingly used since the 1980s so that soldered boards can be cleaned with water or water-based cleaners. This eliminates hazardous solvents from the production environment, and from factory effluents. Pressure is applied through the whole process (usually 15 s) to ensure that components stay in place during cooling. The heating element is heated and cooled for each connection. Up to 4000 W can be used in the heating element allowing fast soldering, good results with connections requiring high energy. Laser soldering is a technique where a ~30-50 W laser is used to melt and solder an electrical connection joint. Diode laser systems based on semiconductor junctions are used for this purpose. Suzanne Jenniches patented laser soldering in 1980. Fiber focus infrared soldering is technique where many infrared sources are led through fibers, then focused onto a single spot at which the connection is soldered. Copper tubing conducts heat away much faster than a conventional hand-held soldering iron or gun can provide, so a propane torch is most commonly used to deliver the necessary power; for large tubing sizes and fittings a MAPP-fueled, acetylene-fueled, or propylene-fueled torch is used with atmospheric air as the oxidizer; MAPP/oxygen or acetylene/oxygen are rarely used because the flame temperature is much higher than the melting point of copper. Too much heat destroys the temper of hard-tempered copper tubing, and can burn the flux out of a joint before the solder is added, resulting in a faulty joint. For larger tubing sizes, a torch fitted with various sizes of interchangeable swirl tips is employed to deliver the needed heating power. Most experienced plumbers seldom use propane fuel. In the hands of a skilled tradesman, the hotter flame of acetylene, MAPP, or propylene allows more joints to be completed per hour. However, it is possible to use an electrical tool to solder joints in copper pipe sized from 8mm to 22mm. For example, the Antex Pipemaster is recommended for use in tight spaces, when open flames are hazardous, or by do-it-yourself users. The pliers-like tool uses heated fitted jaws that completely encircle the pipe, allowing a joint to be melted in as little as 10 seconds. Solder fittings, also known as capillary fittings, are short sections of smooth pipe designed to slide over the outside of the mating tube, are usually used for copper joints. Commonly used fittings include for straight connectors, reducers, bends, and tees. There are two types of solder fittings: end feed fittings which contain no solder, and solder ring fittings (also known as Yorkshire fittings), in which there is a ring of solder in a small circular recess inside the fitting. Because of the size of the parts involved, and the high activity and contaminating tendency of the flame, plumbing fluxes are typically much more chemically active, and more acidic, than electronic fluxes. Because plumbing joints may be done at any angle, even upside down, plumbing fluxes are generally formulated as pastes which stay in place better than liquids. Flux should be applied to all surfaces of the joint, inside and out. Flux residues should be removed after the joint is complete or they can, eventually, erode through the copper substrates and cause failure of the joint. 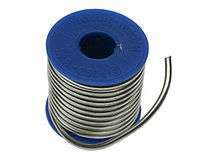 A number of solder materials, primarily zinc alloys, are used for soldering aluminium metal and alloys and to some lesser extent steel and zinc. This mechanical soldering is similar to a low temperature brazing operation, in that the mechanical characteristics of the joint are reasonably good and it can be used for structural repairs of those materials. Electrical resistance (usually described as a material's opposition to the flow of an electric current) is used to convert electric energy into thermal energy as an electric current (I) conducted through a material with resistance (R) releases power (P) equal to: P = I² R, where P is the power measured in watts, I is the current measured in amps and R is the resistance measured in ohms. More recently environmental legislation has specifically targeted the wide use of lead in the electronics industry. The RoHS directives in Europe required many new electronic circuit boards to be lead free by 1 July 2006, mostly in the consumer goods industry, but in some others as well. In Japan lead was phased out prior to legislation by manufacturers due to the additional expense in recycling products containing lead. However, even without the presence of lead, soldering can release fumes that are harmful and/or toxic to humans. It is highly recommended to use a device that can remove the fumes from the work area either by ventilating outside or filtering the air. In the joining of copper tube, failure to properly heat and fill a joint may lead to a 'void' being formed. This is usually a result of improper placement of the flame. If the heat of the flame is not directed at the back of the fitting cup, and the solder wire applied degrees opposite the flame, then solder will quickly fill the opening of the fitting, trapping some flux inside the joint. This bubble of trapped flux is the void; an area inside a soldered joint where solder is unable to completely fill the fittings' cup, because flux has become sealed inside the joint, preventing solder from occupying that space. ↑ Brady, George; et al. (1996). Materials Handbook. McGraw Hill. pp. 768–70. ISBN 0-07-007084-9. ↑ Kapp Alloy & Wire, Inc. "Products". Kapp Alloy & Wire, Inc. Retrieved 5 March 2013. ↑ Rahn, Armin (1993). "1.1 Introduction". The Basics of Soldering. John Wiley & Sons. ISBN 0-471-58471-1. ↑ Properties of Gold-Nickel Alloy Brazed Joints in High Temperature Materials; Prof. Jakob Colbus & Karl Zimmermann. ↑ "Unitek Eapro: Electronic Assembly Products". Archived from the original on 2008-05-06. ↑ "SWE Women - Jenniches". Society of Women Engineers. Retrieved 20 May 2014. ↑ "Pipemaster Soldering Tool". Smart Plumbing Products. Smart Contractor Products. Retrieved 2014-05-20. ↑ What is the definition of soldering torch? 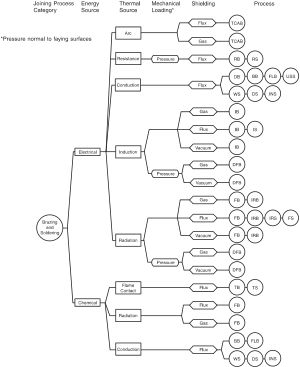 A useful table of various solder alloy liquidus temperatures can be found in an article hosted at the EMPF.